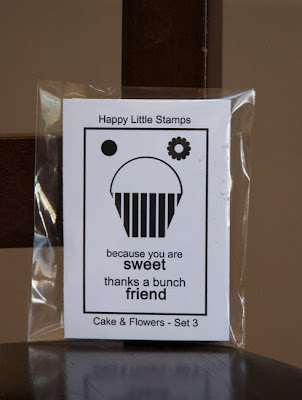 Etsy Find: Happy Little Stamps & a GIVEAWAY! Okay so I must say I am an Etsy fan. I love to go and see all the thousands of things that are there and what thing inspires me. Well I came upon this little stamp company. Happy Little Stamps. The stamps are mounted on cling foam and so all you have to do is cut the image out and stamp away! Easy right? Well let's find out. This is what they look like in the packaging. As you can see they are pretty simple. You just cut them out and store them in a CD case. All 3 sets of stamps fit nicely into one case and I trimmed each label and adhered them to the case so I know what stamps are in there. 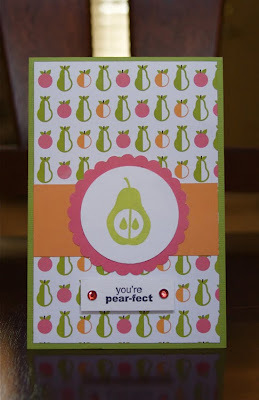 This card measures 4 x 6 and I used the pear and sentiment from the So Sweet Set 2. Love how this came out. It went "pear"fectly with the patterned paper! This card measures 4.25 x 5.5. I used the You're Great set. I love them so much!! So much fun to work with! This little one measures 3x3. So much fun! What a gem this is! I love this little tag! It is a 2.5 inch tag. Cardstock: Bazzill Basics OP White, Crimson; Ink: Fluid Chalk Ink Warm Red, StazOn Jet Black; Jewels: Kaiser Craft; Tools: Fiskars 2" circle punch, Marvy Uchida 2.5 Scallop punch; Hemp misc. Overall I absolutely adored these stamps! Truly. They were a pleasure to work with. They were clean and evenly stamped. 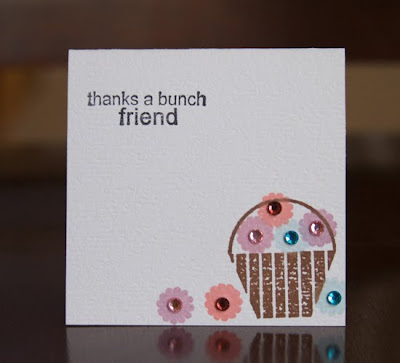 Tip: Make sure you stamp on non textured cardstock to get a cleaner look. I wanted to save the best for last. The price. Each set is $5. I KNOW RIGHT?! $5. You can buy them on the Etsy shop Happy Little Stamps. Would these be something you would indulge in and get all three sets? Or would you just dip your toes in and get one? Leave a comment by midnight tonight EST and be entered to win the So Sweet Set and the Cake & Flowers Set. WOOT WOOT! I would probably indulge and get all 3. I have a stamp weakness. They are all so adorable!! Thanks for the chance to win. Really cute stamps! I might have to indulge and get all 3! TFS! 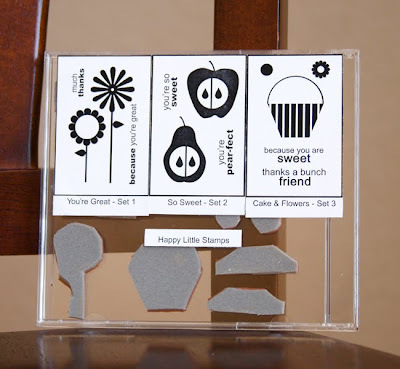 Cute little stamp sets. I love these. Would I indulge, of course for $5 a set. Yum, yum. Thanks for a chance to win. These are cute. I would love to give them a try! Oh my goodness, those stamps are too cute!!! I am definitely going to have to go check that link out! Thank you! Cute adorable stamps! Thanks for the chance to win. These are really cute! And a great price for rubber, too! Very cute! I'm a sucker for cute stamps, so I'd probably buy all three. I love small sets like these because you can intermingle and have so many options. SUPER cute stamps!!! Love em!!! Cost of unlimited possibilities - PRICELESS!! These are terrific! And at a great price too! How cute!! These stamps are so cute! I would definitely love to indulge and try at least one set. These stamps would be perfect for making cards for teachers. They are cute sets and very affordable so I would probably have to indulge in all three!! 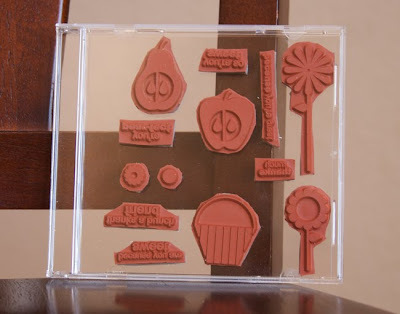 Oh, I LOVE rubber stamps that are acrylic mounted ... keep these sources comin', please!! Amazing price and adorable stamps! Of course, free is always better! Thanks for highlighting them..Etsy is the best! love them all, too cute. I must have them all... great price too. These are so cute and adorable, I would probably want them all! 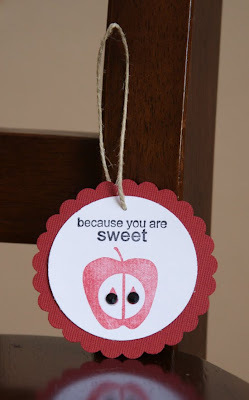 I like the simple stamps, there is so much more you can do to embellish them! CUTE!!! Well, I would love to give it a shot. It seemed like a lot of work until you showed us it wasn't. Thanks for the review! I would have to try all three~ Love that they are rubber!!! How cute! And only $5? Wow - that is a lot of stamps. Will go check them out on Etsy. Thanks! Very cute! At $5, what a deal!!! I'm likin' all three! Cuteness! I would totally indulge and get all three! 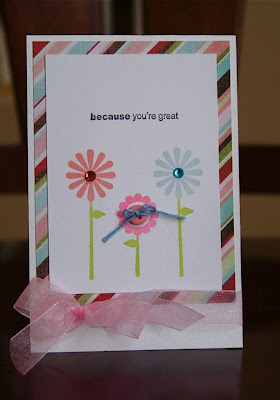 These are so cute and I would have never found them if it weren't for the scrap review!!! All 3 stamps are AWESOME!!!! I especially love the So Sweet stamp. The stuff you made with all of these stamps turned out fabulous. I would get all three as well! I mean, what a great buy and the stamps are just impossibly cute!! $5!!! What a sweet treat!! Cute stamps and totally cute price. Absolutely love them! Your cards are just adorable!! I love that they can be cut apart and stored in a cd case, as opposed to boxes and drawers, which make them harder to transport to a crop. And the price seems really reasonable!! Will definitely have to work those into my scrappy budget!! Of course I would have to buy them all. Especially for $5 each! Very Cute! WOW What a bargain! $5 is unheard of for a set of stamps. What am I waiting for? Adorable stamps...and I LOVE the price!! I am mainly a scrapbooker and have a hard time justifying the cost of stamps. Which is rather funny because I don't seem to feel the need to justify the cost of anything else!! But at $5 a set...who needs justification!!! If my pocketbook could handle it, I would get all three. Of the three is is cake and flowers. Too cute! These are so cute! I love the price too. Wow $5! They make card making look simple & adorable! One of a kind! Thnx for sharing. Call me indulgent! I would love to win all three. I love what you did with these, and how functional these cuties are! thanks, as always, for your wonderful review! These are adorable! Going to the etsy shop right now! Love their great graphic design, and you can't beat their price point! These look like well made stamps. I would jump in and get all 3 stamp sets since the price is right, & considering postage, buying all 3 at one time would be more economically feasible. The only thing is,...I do not need these type of designs as I have plenty close to these already. Cute stamps! Gotta have some! super cute and you can't beat that price! I would SO grab all three! They're adorable, and at $5.00??? What's not to love? Those are absolutely ADORABLE!!! And what a FABULOUS price!!!! GREAT examples too! TFS!!! These stamps are great! For oly $5 per set I would probaley get all three. Who couldn't use a few Happy little stamps? Love these stamps and you can't beat the price!! Great looking stamps! Great Price! I just might get all three. Very cute and fun thanks for sharing!!! I have never tried the cling stamps before so I would probably just get one set to try them out and see how I liked them. That set is super cute though. Wow you cant beat the price of these awesome stamps! Love all of them!! Very cute stamps - love what you created! These are awesome stamps, and you can't beat the price! I love Etsy - there are so many great finds there. Your samples using the stamps are fantastic - sometimes I am creatively challenged, but your ideas really sparked my imagination! Oh, I think I'd have to have all three so that the CD case can be pleasantly full. These stamps are precious and you can't beat the price. Thanks for introducing me to the company. Your projects were darling. Cute stamps and economical too. What more could you ask for! OHMYHEAVENS, I love all of them! So cute! I would totally get them all. And I love those cards you made, especially the first two. Great images and even better prices. Definitely will check them out. Oh, so cute and creative! Many creative ideas flowin' here! Very cute stamps. I would love to try them out. They seem like a good deal for $5, i would probably have to buy all 3. Super cute. 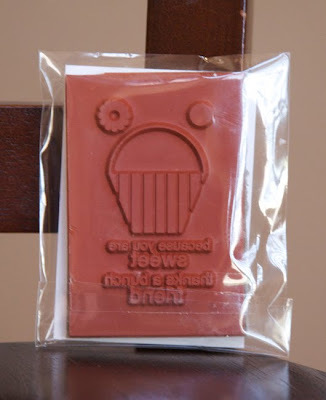 I'd love to create with these stamps. Great job Ashley.